Britain's Adam Yates will be chasing a stage victory in his first Grand Tour - the Vuelta a Espana - which starts on Saturday in Jerez de la Frontera. Fellow Briton Chris Froome, the 2013 Tour de France winner, is among the favourites to win the race, along with Giro d'Italia winner Nairo Quintana. 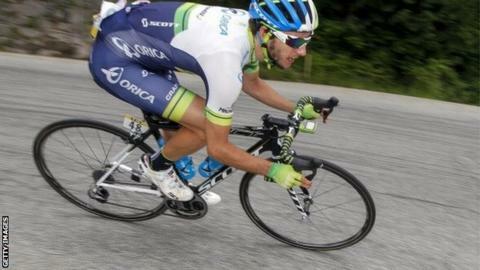 Yates, 22, who rides for Australian team Orica GreenEdge, told BBC Sport: "Stage six's mountain finish suits me. "That's my target but there's no pressure or expectation from the team." The Vuelta features five flat stages, 13 hill and mountain stages and two time trials, the second of which is on the final stage - a 9.7km individual time trial in Santiago de Compostela. Bury-born Yates, whose twin brother Simon also rides for Orica, is looking to build on an impressive set of results in his debut year as a professional. He became the first British rider to win the week-long Tour of Turkey in May, was fifth in the Tour of California and sixth in the Criterium du Dauphine, which is a Tour de France warm-up race. "I never expected to be competing at this level so soon," he continued. "I won the stage race in Turkey and was close to a victory at the Dauphine so I'm pretty happy with how things are going." "I was more gutted to crash in San Sebastian than miss London," he said. "I had a good chance of finishing at least second in that race. But that was a couple of weeks ago and I'm over the concussion and ready to race. "The initial plan is for me to race the first two weeks of the Vuelta to the second rest day and then see how fresh or tired I am feeling. I am a first-year pro riding in my first Grand Tour and I'm hopeful I will make it to the end but the team will make the call. "I'm looking forward to the mountain stages but it's the flat stages that worry me most. Flat stages in the south of Spain are notoriously windy and I'm not the biggest rider so I'll be looking to stay safe and just get through them." Orica have fared well in team time trials in the other Grand Tours, winning the Giro d'Italia's earlier this year and the Tour de France in 2013, but Yates says they are unlikely to make it a hat-trick in Jerez because the make-up of the team is more geared to winning stages and supporting their Colombian team leader Esteban Chaves. Colombia's Quintana and Spaniard Valverde who both ride for Movistar, Froome and Rodriguez, who has won eight Vuelta stages and the mountains classification in 2005, are the favourites to contest the overall victory. Froome, who crashed out of this year's Tour de France, finished second at the Vuelta in 2011 and was fourth in 2012. Spain's two-time Vuelta winner Alberto Contador, who was also forced to abandon the Tour after an accident, has defied expectations and is fit to race.